"Cool and refreshing, this summertime drink is perfect for weddings and showers. Everyone I make this for just loves the taste." In a saucepan, dissolve the sugar in the water by bringing it to a boil over medium-high heat. Turn off the heat and allow it to cool. Combine the sugar water with the pineapple juice, lemonade, orange juice and pureed strawberries in a 6-quart container. Mix in the rum to taste. Put the entire mixture into a large plastic ice cream pail and freeze overnight. To make the drinks to order, scoop 1/2 cup of the frozen mixture into an 8 oz glass. Fill the glass with lemon-lime soda and serve with a straw. Keeps well in freezer for up to one month. A sweet treat to beat the heat! 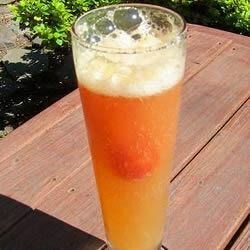 we made this drink in my creative chef class at a high school and everyone loved it.. its my new fave summer drink. Fun to make, but is very sweet. I will probably make it again, but with less sugar, more rum and maybe diet lemon-lime soda.